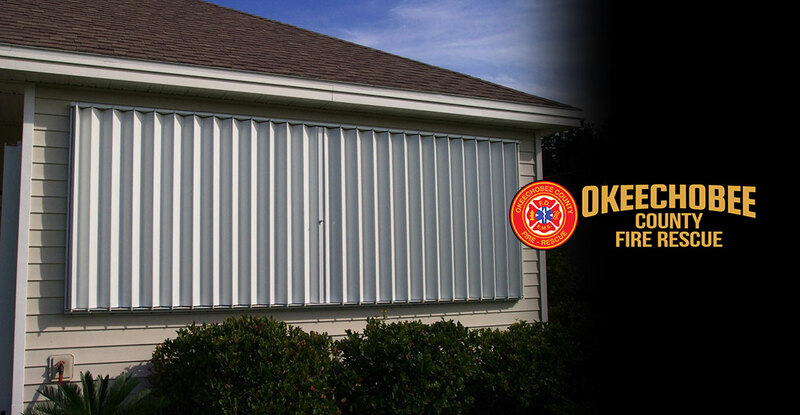 Okeechobee County Fire Chief Ralph Franklin is urging residents to remove the hurricane shutter materials they installed for Hurricane Matthew from their homes. Many residents during the recent threat of Hurricane Matthew installed various types of coverings over their windows to protect the home from wind and flying debris damage. However, leaving these up after the storm threat has passed, may create the inability to escape your home in the event of a fire. Chief Franklin states that ‘these barriers used to prevent damage, can prevent you from escaping your home in the event of a fire, especially from the sleeping areas. Additionally, these also create a barrier to firefighters that may prevent or slow entry into the home in the event of a fire”. Chief Franklin also states, “We are very appreciative of the fact that our citizen’s listen to local official about Hurricane Matthew and that they took protective actions to protect themselves and their homes. However, now that the storm has passed, it is highly encouraged that you remove the protective materials from your home in the interest of fire safety”.